The Green New Deal Is Not a Policy. It’s a Manifesto. (Bloomberg Opinion) -- Rep. Alexandria Ocasio-Cortez’s Green New Deal arrived last week to an uneven reception. Six contenders for the Democratic presidential nomination endorsed it. Some commentators on the left gushed over it. More on the right and even center-left condemned it. Almost all of them, however, are misunderstanding it. The Green New Deal is best seen not as a policy proposal but as a political manifesto. It seeks to define what it means to be a progressive in the Trump era. In so doing it draws a clear distinction with centrist Democrats — exactly what progressives need to do in order to take a leading role within the party. That’s why the endorsement of the Green New Deal by the presidential hopefuls is particularly significant. They see the progressive shift coming, and they have chosen to embrace it. This strategy makes a lot of sense: The entire country is moving left, and the change will remake both political parties. This leftward move is almost preordained by demographics. 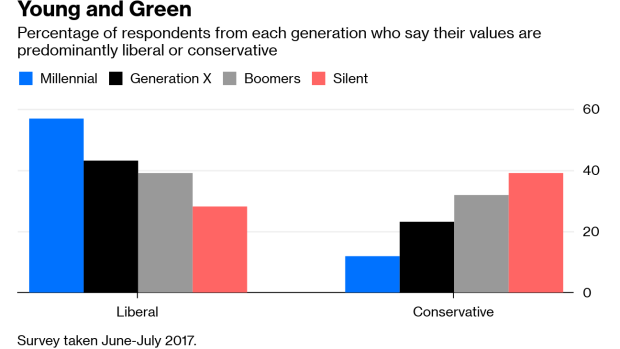 Each generation, from the Silent Generation (born from the Depression through World War II) to the Millennials (born from the early 1980s to the mid-’90s) has more liberals and fewer conservatives than the one that came before it. Centrists are equally represented across generations. Despite this, however, the dominance of the Baby Boom generation has held the parties relatively static since the late the 1990s. There has been some movement leftward, particularly on social issues, but overall not nearly as much as the generation gaps would have suggested. As a result, there is enormous pressure for change. That pressure was harnessed by progressive candidates in 2018 and now has an outlet: the Green New Deal. What does this new political force look like? First of all, it is proudly pro-government. Democrats have gotten used to couching their proposals in heavily technocratic language. The idea was to sound responsible and sensible, especially compared to the wide-eyed free-market fantasies proposed by Republicans. So Democratic proposals were developed by economists at prestigious universities, carefully tweaked in focus groups to appeal to the broadest possible coalition, and certified as deficit-neutral by the Congressional Budget Office. The Green New Deal is none of those things. Progressives are uninterested in such compromises and will not be limited by such requirements. In fact, the Green New Deal’s supporting documents suggest that the resources of all the billionaires and private companies in America are inadequate to the task facing the nation. It is government and government alone that is capable of the sweeping reforms necessary to battle climate change. Government can pay for whatever costs are incurred in the process, because it has the power to print money if needed. This last point has been roundly mocked, and indeed the FAQ that included it seems to have been removed from the internet. (Ocasio-Cortez’s chief of staff later said it was an unfinished draft, but it was posted on her website.) At any rate, the idea is not new; in fact it has a storied history in American politics. In 1969, President Richard Nixon proposed the Family Assistance Plan, which guaranteed Americans a basic income but also required the able-bodied to work. More liberal members of Congress opposed the work requirement, and in 1972 presidential candidate George McGovern proposed the so-called “demogrant,” which would have offered a family of four the equivalent $24,000 annually in today’s dollars — unconditionally. The backlash against McGovern’s idea was intense, and it was abandoned. With the rise of the conservative movement over the next few decades, sentiment shifted from expanding entitlements toward curtailing or eliminating them. The Green New Deal is a sign that sentiments are shifting yet again — toward entitlement expansion. It will be years, of course, before progressives have the political power to make anything close to these proposals a reality. But their influence is only going to grow. For the Democratic Party and perhaps the nation as a whole, the era of small government is ending.